(Washington, D.C.): Center for Security Policy Press today launched a collection of monographs called the Civilization Jihad Reader Series with the publication of an update to an earlier and highly influential study concerning the insinuation of Islam’s supremacist shariah legal code into the U.S. judiciary. 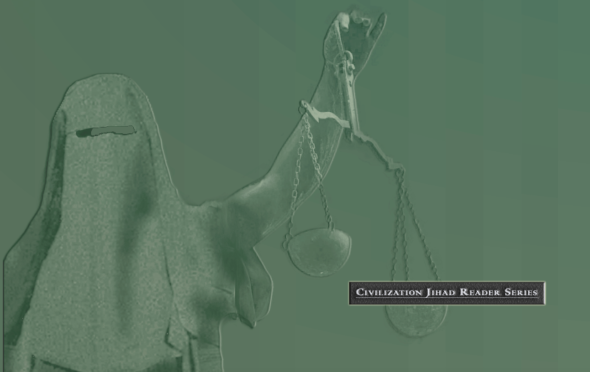 Entitled Shariah in American Courts: The Expanding Incursion of Islamic Law in the U.S. Legal System, this inaugural booklet documents 146 cases in 32 states in which a party to litigation attempted to have the matter resolved by applying shariah, rather than the statutes of the state in question. The Center first raised an alarm about the penetration of American jurisprudence by one of the most anti-constitutional of such foreign legal codes with its 2011 report, Shariah Law and American State Courts: An Assessment of State Appellate Court Cases. That study examined a sample of fifty cases and found that in twenty-seven of them, in twenty-three different states, the courts in question allowed the use of shariah, generally to the detriment of women and/or children whose rights under our Constitution were infringed. With the bedrock of the American Republic being the U.S. Constitution and individual state constitutions derived therefrom, these analyses provide insights into how our own legal system can be – and is being – used as a mechanism to anchor and expand in this country shariah, an ideology wholly at odds with such documents and, more generally, irreconcilable with freedom and democracy. Most Americans take the rule of law and our constitutional rights for granted. Yet, Shariah in American Courts is a reminder of how even institutions like our judiciary can be influenced – and potentially subverted – by foreign legal codes and practices, to the grave detriment of our nation and liberties. This monograph also suggests that the effort to invoke shariah in U.S. courts is expanding. Worse yet, the total number of such cases is surely far larger in light of the fact that the proceedings of the vast majority of them are not published. The good news is that, at least at the appellate level, judges appear increasingly to be rejecting the use of shariah in their courtrooms. A contributing factor to these rulings may be the rising awareness in the judiciary of what is afoot, thanks to the adoption in numerous states of legislation drawing upon a model statute known as “American Laws for American Courts” (ALAC). While the average citizen of this country would assume it to be the case that only laws derived from or consistent with our Constitution would be applied in U.S. courts at both the federal and state level, the evidence that foreign laws – including, but not limited to, shariah – are encroaching has moved legislatures across the country to act. Tennessee, Louisiana, Arizona, Kansas, Oklahoma, North Carolina, Washington and Alabama have adopted ALAC’s prohibitions against the use of such foreign laws in their respective state courts if they are at odds with constitutional rights or state public policy. (Florida also enacted in 2014 a version of this legislation). The Center is delighted to be putting a spotlight on the Muslim Brotherhood’s stealthy, pre-violent jihad in America. It behooves each of us to become knowledgeable about the presence in our judicial system – and, for that matter, in other civil society and governing institutions – of forces seeking the destruction of our Republic. Additional monographs in the Civilization Jihad Reader Series will be published in coming months. For more information on the Center for Security Policy, the offerings of its Press and the necessity of countering the Muslim Brotherhood and its efforts to impose shariah in America, visit www.SecureFreedom.org.